Designed with a modern style and strong build, this vanity is a perfect choice for any bathroom. The white engineered stone counter and white solid wood base make a beautiful look in your bathroom. This simple vanity set from Home Decorators Collection will fit right into any bathroom decor. The product is warranted to be free from defects in material and workmanship for a period of 1 year from the date of purchase to the original owner. To obtain service, please contact us at 1-866-518-0120 between 9:00 a.m. and 4:00 p.m. EST Monday-Friday. 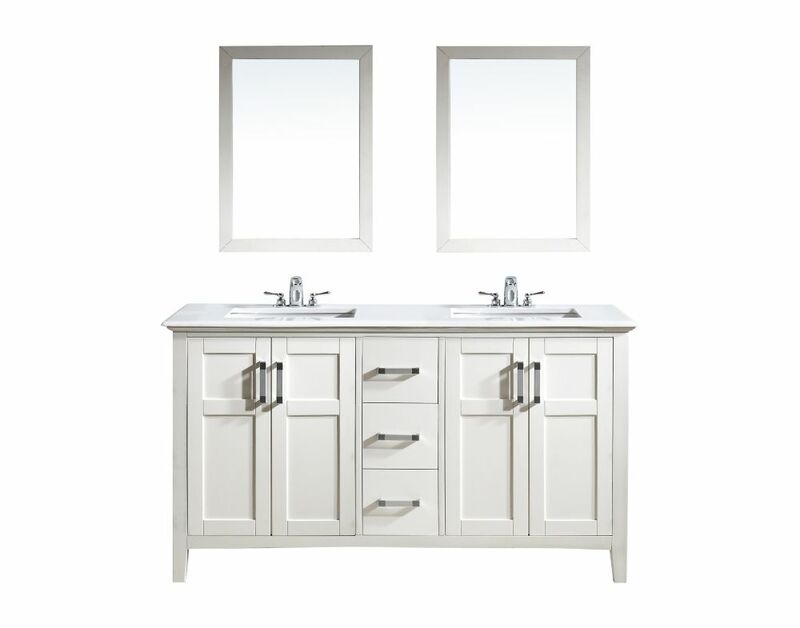 Explore a classically modern touch with this 60" gray Bosconi double vanity set. The integrated ceramic sinks and vertically mounting mirrors lend to a smart and efficient design. Features include two spacious cabinets with soft closing doors, as well as, one detached side cabinet with three pull out drawers. Plenty of space to house your essential bathroom supplies. For some added traditional style in your bathroom, choose this beautiful vanity. The good-looking white ceramic counter and white particle board base make a big difference in your bathroom. It comes with a double-door cabinet and drawer for even more room to keep items. This classic set from Home Decorators Collection will make your bathroom look brand new. Baywind Collection 61-inch 3-Drawer 4-Door Double Vanity in White With Engineered Stone Top in White Designed with a modern style and strong build, this vanity is a perfect choice for any bathroom. The white engineered stone counter and white solid wood base make a beautiful look in your bathroom. This simple vanity set from Home Decorators Collection will fit right into any bathroom decor. Baywind Collection 61-inch 3-Drawer 4-Door Double Vanity in White With Engineered Stone Top in White is rated 1.0 out of 5 by 1. Rated 1 out of 5 by Arash from Low quality. Cabinet doors had cracks in it. My contractor installed it without telling me because he did not want to return it to store. Now I ended up with cracked doors. Is the Faucet spacing really 8&quot;. In the pictures it looks like 4&quot; ??? is someone able to send me or post a sketch dimension so I know where the sinks dimensions and spacing is?